When the first rumors of the Kindle Ice Wine circulated last November I was one of many who was surprised to learn that Amazon had a higher resolution screen in the works, but I shouldn't have been. While I was doing some custodial work on the blog Sunday night I came across an old post which reminded me that E-ink had been working on a high-res screen for longer than one might think. 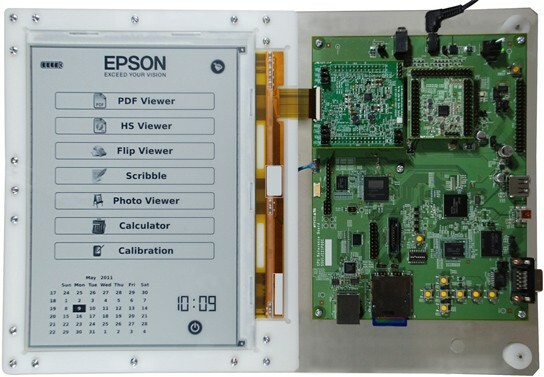 Way back in 2011, E-ink and Epson (which made the screen controller chip) announced that they were showing off a new 9.7" E-ink screen at SID Display Week. That display sported a screen resolution of 2,400 x 1,650, giving it a sharpness of 300 ppi. That 2011 screen was probably based on the Pearl generation of E-ink's screen tech, and not Carta, so it would be a generation out of date if it were released in 2014. But that could readily be corrected should someone cough Amazon cough decide to release a larger ereader with that resolution. Over the past few years Kindle DX lovers have been alternating between lamenting its passing and agitating for a replacement, and today we have a reminder of just how great that replacement could have been. It's a shame no one ever used this screen, but more importantly let's consider what this says about the screen tech market over the past few years. For example, last year Kobo released the Aura HD. That had a 6.8" screen with a 265 ppi sharpness, and while that was a great screen I do have to wonder why Kobo didn't go with the 9.7" screen. It also makes me wonder why no one else used this screen. Could it be production issues, do you think? What you have found is evidence that there is a consensus among ereader vendors that the market for a premium large format reader is non-existent. That is, that while the tech exists, the manufacturing cost (probably because of low yields) would require a selling price that would lead to sales volumes too low to justify the exercise. What we are seeing is low-res large format and high res small format selling for similar prices in the $150-250 and very large mid-res devices at $1000 or so. That suggests a profitable large format high res reader would have to run in the $400-600 range to be profitable. And weight is going to be an issue at that size. Kindle DX ran well over a pound, if I remember correctly. That does not sound like a particularly high volume product. I don’t doubt you could find thousands or tens of thousands of people interested in a high res large format eink reader… in the abstract. Attach a $500 price to it and that interest evaporates. In a world where a $200 premium reader is decried as too expensive, demand for a $400-600 large format reader is probably going to be mininal. One-of tech demos are useful to see what the limits of the tech are but they tell us nothing of the yield and economic viability of actual products would be like. If even the low volume hardware-only vendors like Onyx and Pocketbook have passed on this tech the odds are nobody can make the numbers work. So far. IIRC, the graphite DX was priced at $485 when it debuted in 2010. That price is a deal killer for most people. I seriously doubt that Amazon could sell a PaperWhite DX, even if they sold it at cost, for less than $400. It debuted in mid-2009, and was updated in the summer of 2010. I just Googled it, for kicks. The Graphite DX with the Pearl screen from 2010 was priced at $379. Perhaps I was remembering the price from the VizPlex screen DX from 2009. The original was priced at $489. For that matter, the Kindle 1 launched at $399. Sp you don’t think that anyone could have done a $200 ereader with this screen? I think they could have; in fact, I think the 6.8″ screen probably cost as much to make due to the short production run the first time around. I don’t know the precise dimensions of an H2O but a DX Kindle screen is more than twice the size of a regular Kindle. The small production run would increase the cost per unit. If it were front-lit, I can’t imagine what it would take to evenly light a screen that size. If it weren’t done properly, the result would be hideous. You couldn’t do a reader like that for $200…not unless you want to lose your shirt. Well, I don’t know that it is more difficult to light the larger screen evenly, but we do know that the first frontlight 9.7″ units didn’t launch until this summer. That detail is a strong argument that you are correct. There’s certainly a market for large-format epaper readers among lawyers, physicians, and scientists who must read documents that are published as 8.5×11 or A4 PDFs. Those documents can’t reflow and, in the case of scientific documents, the small type is hard to read on small screens. But I illustrate why that market isn’t very large. I thought of getting a Kindle DX to read such documents but decided not. Why? Because my full-size iPad with its sharp Retina display is more than up to the task. I don’t live in an off-grid cabin in the woods or do much reading at the beach, so the advantages of epaper aren’t important.